hi, this is first of the type i made, using a nature background, cause all my other wallpaper backgrounds are effects, i used a background with lot of trees and a small path between, i multiplied it about 3 times, and used a red-brown-black gradient tool. for the charector, i overlayed it 3 times and use the burn tool to create side effects, i used the brown gradient tool for the hair. I agree with the guy above me... GREAT colour combination! OOOO brilliant this! I've been following Inuyasha togeather with a few other series for a loooong time now and its deffinately one of my very favourite series. This piece with sesshoumaru totally does both him and the series justice. I love what you've done with the colors and contrast with this one - sesshoumaru looks very much a part of the overall wallpaper which you dont often find. It makes him look very dangerous. and brilliant - hes one of my fave characters in that series and im seriously loving this wallpaper! I only can say, awesome Seshou! a very awsum sesshoumaru wallpaper . . .keepit up! Amazing,beautiful it's a great wall! 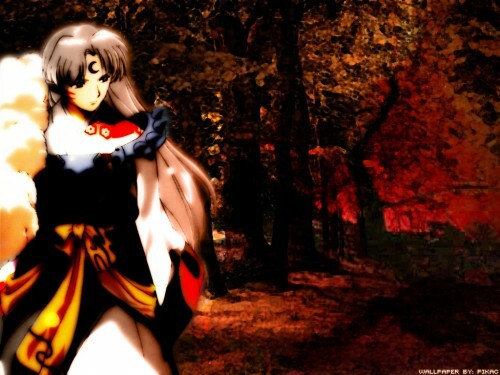 So beautiful, I love sesshomaru...Thanks! I loved your job, Sesshoumaru fits with the background, i like it? What a perfect work! He is a very fantastic wall on Sesshomaru! ?-?-?-?-? ????????! ? ????, ? ????????? ? ???? ??? ???! Sess in forest :D. You are pro.